The Australians will refer to this type of wine as STICKIES and most likely because if you do spill some on clothing or what have you, it can become a sticky situation rather quickly as this wine is a bit on the sweet side, but is nicely balanced so you won’t wince or go into a diabetic coma. 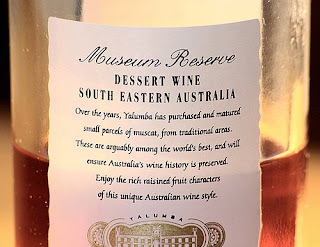 The Yalumba Museum Reserve Muscat from Barossa Valley, which I picked up last weekend because we were having guests and we planned on smoking some cigars afterward. I thought hmmm what would be a great after dinner quaff, that would pair nicely with a chocolate-themed dessert and a fat-Cuban cigar? An old friend was gracious enough to part with a Cuban from his recent trip there. He picked up a few hand-rolled cigars, of which he gave me one, the Romeo Y Julieta Cuban cigars, Julieta 2 (Churchill) and wow it was a thing of beauty! Everyone who tried it and loved how smooth it was full-bodied with rich complex flavors like the delicious wine which accompanied it. Many will compare this to a Tawny Port which is a fair statement, as it’s very similar in taste and style, some would even say it compares favorably to a Fonseca 40 year old Tawny, but without the huge ($80.00) price tag, to which I say possibly as I have never had a 40 year old Tawny it's hard to make a comparison. Price: Some folks could pay $45 to $250 for a current top release of Sauternes or as much as $1100 for a vintage Chateau d’Yquem if you could find one and I know it’s not on the same level, but you get the point I’m attempting to make here, which is the Yalumba Muscat Museum Reserve will cause the checking account little grief at a paltry $15.95 – $19.95 depending on where you shop and at this price point it makes this wine a serious QPR, champ. First Sniff: This wine has some sophisticated aromas roiling around in the glass. Scents of honey, molasses, dried figs, and raisins, with some nutty components coalescing into an ever-changing bouquet of delight. First Sip: This fortified wine is perfectly balanced with rich complex flavors of roasted nuts, orange peel, toffee and dried fruits [think raisins and figs] and just a lithe amount of lemony brilliance and acidity to offset the sweetness and long persistent finish. Just a reminder, this wine is meant to be savored, not downed like a shot for maximum enjoyment. Composition: Made from the red and pink clones of the Muscat, a petite grains grape variety, especially adept for producing some of the best dessert wines with very reasonable price points. This wine is fortified with neutral grape spirit and very little fermentation to retain the varietal flavors. This wine is produced in a Solera System a styled blend from many different years and as such is considered NV or Non-vintage, which is re-blended prior to bottling to achieve the amazing complex flavors. Alcohol: Okay the ABV is 18%, about the same as your average Tawny but not as edgy and by the way, it’s an excellent companion to your favorite cigar. My Recommendation: If you live in San Diego, this wine is carried by Costco for a ridiculous price of $15.95 each so run out and get some today. Keep a few around and have some buddies over to smoke some cigars and enjoy another day in paradise. Everyone else not in San Diego, I’m sure this wine is widely distributed, and can most likely find in your favorite wine shop or of course at your favorite online wine store. It’s is very good and will pair nicely with many chocolate styled desserts. You won’t be disappointed! Other voices: Considering this small 375 ml bottle received some 97 points of satisfaction from Mr. RP, whose opinions on wine you may be familiar with already, this alone should be enough to convince you that you will have to give it a swirl.